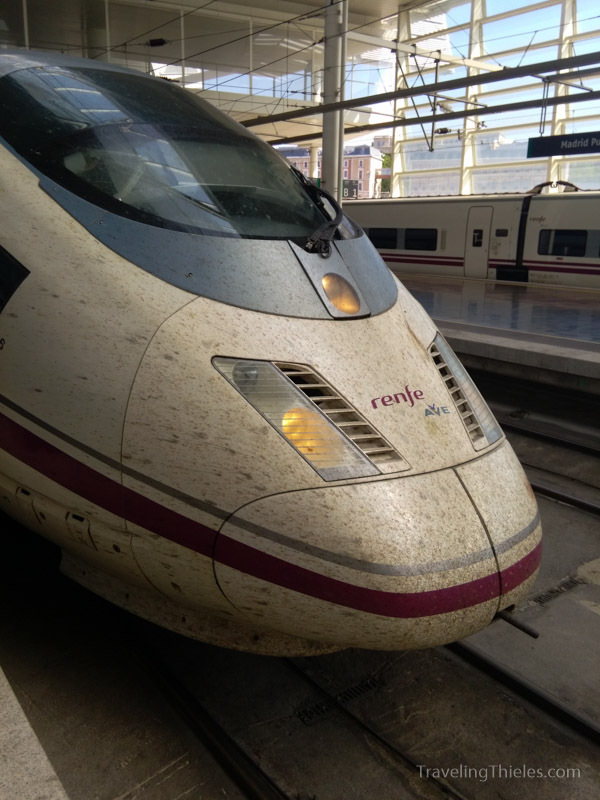 We took the AVE bullet train from Barcelona, which reaches 310 km/hr or 192 mph. It’s crazy to go that fast so close to the ground and it feels like riding a bullet. Even more surreal is how smooth the ride is – like a Cadillac. Evidence of how fast the train moves is on the nose of the engine where all the bug splatters are. 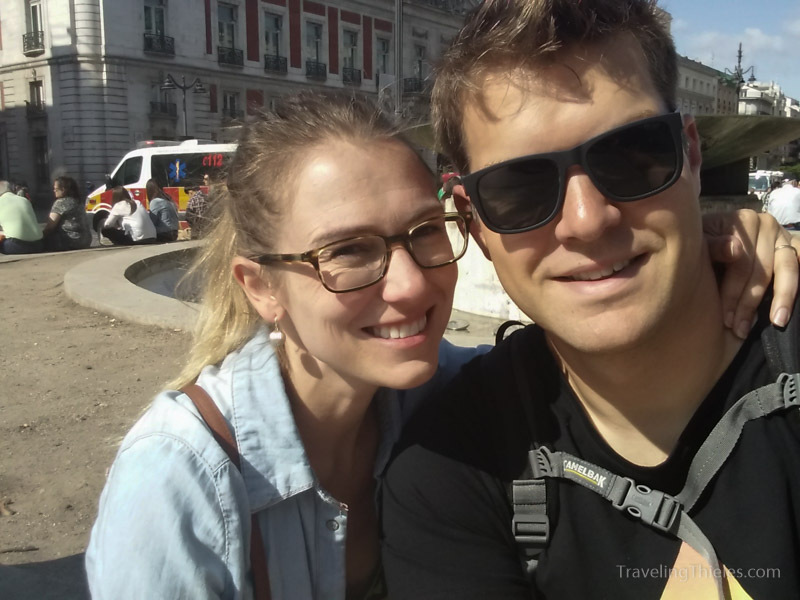 Our first day in Madrid, as usual in any new city, was spent on the ground exploring with our feet. 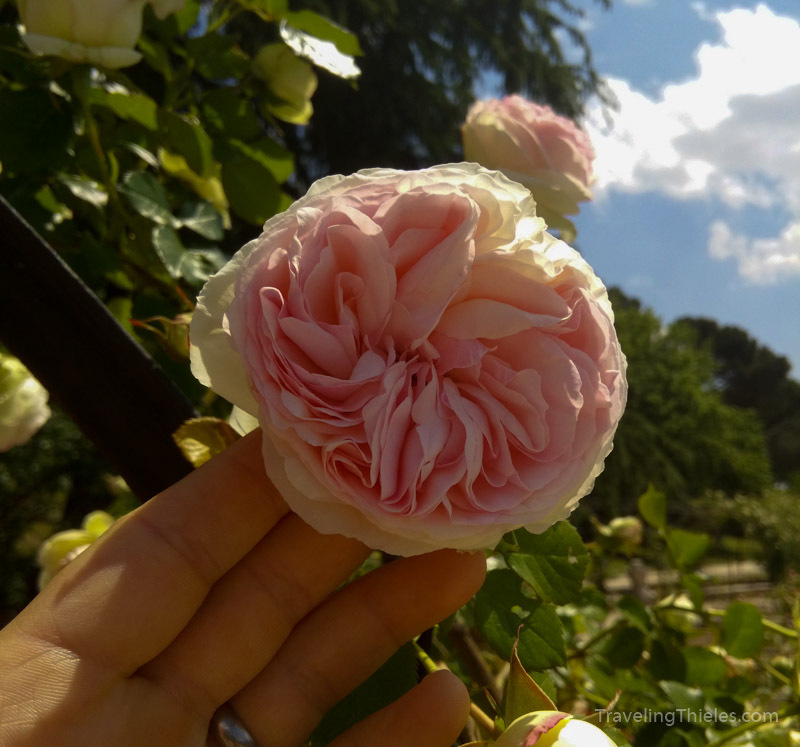 We arrived without too much on our list to do (a bad habit that we have fallen into), but luckily we saw a poster for an annual international rose competition taking place in Madrid (with free entrance!). Turns out it was a pretty big deal with competitors sending roses in from all over the globe. The entries were in a park about the size of a football field. 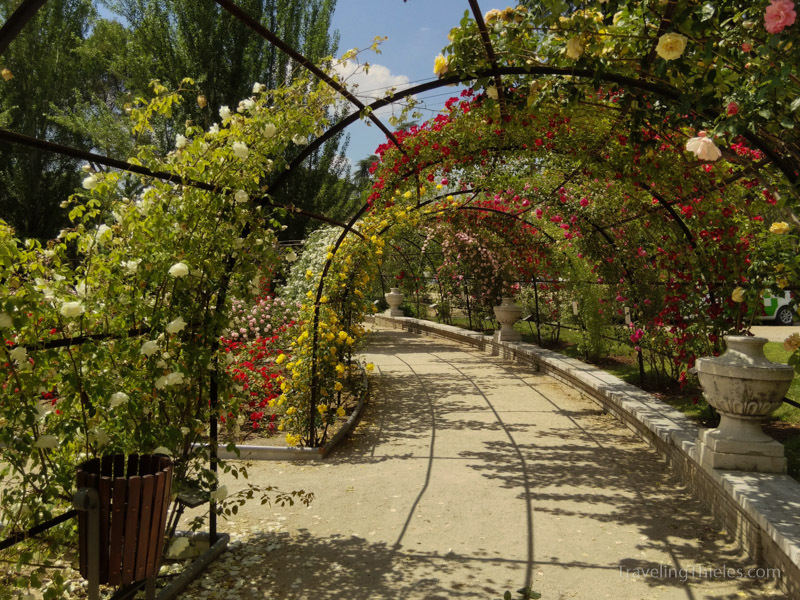 The whole area was surrounded by tunnels of roses. 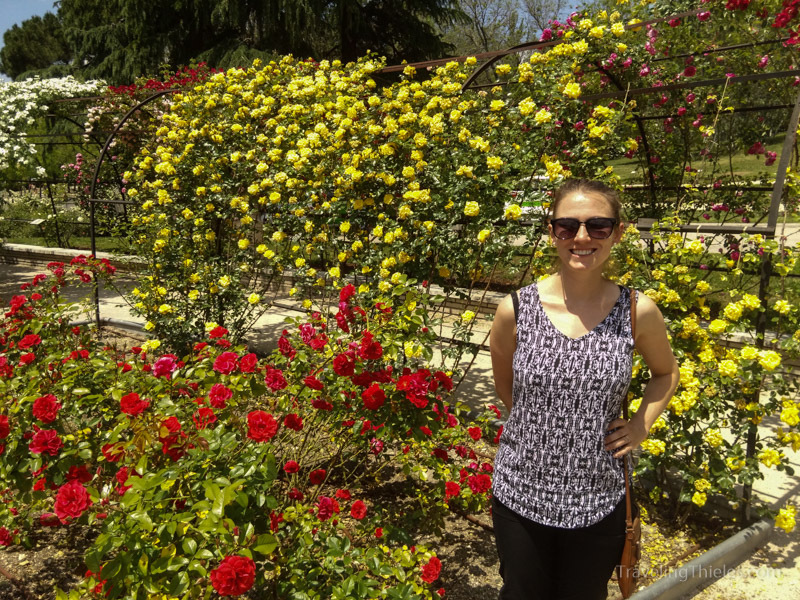 Elisa in front of the roses. 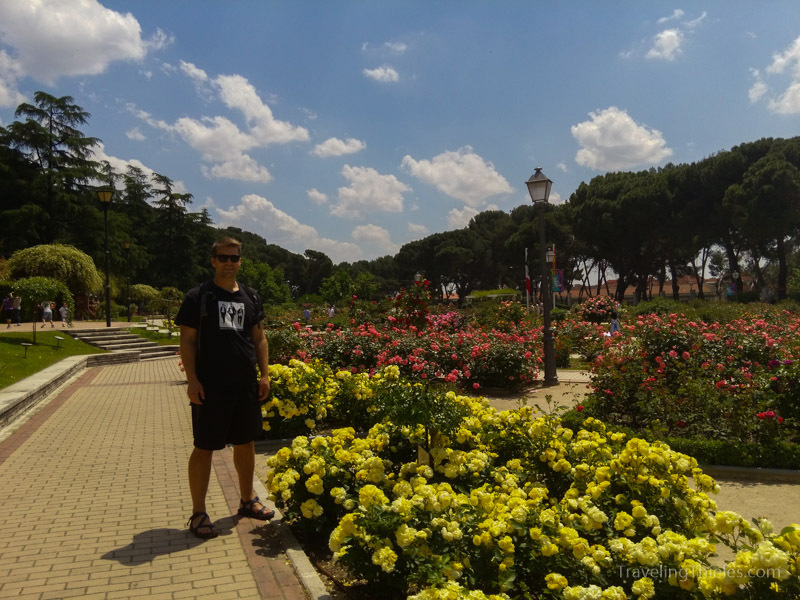 We were surprised at how green everything was in Madrid. It definitely feels more green than Barcelona. To be able to grow all these roses it must be fairly moist as well..
Rose tunnels. 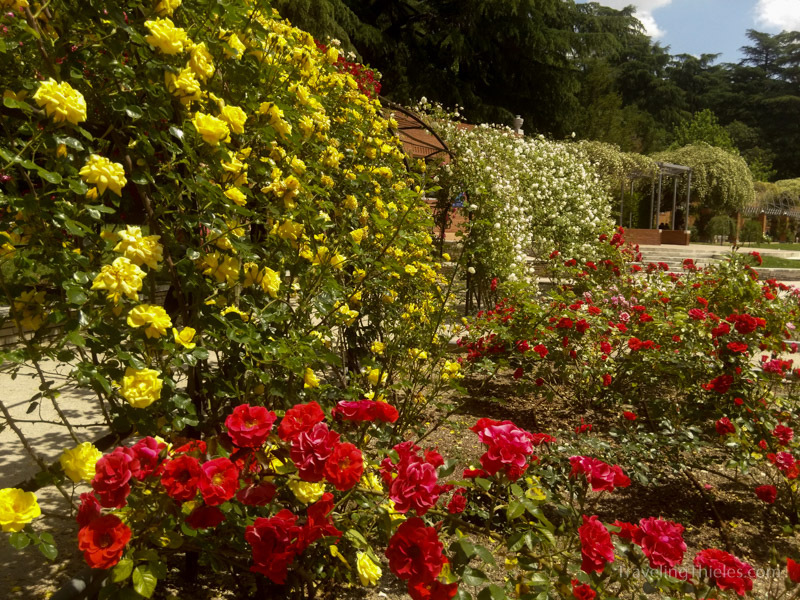 This was more roses than we have seen in one place other than maybe the international rose test garden in Portland, Oregon (which is a can’t miss). 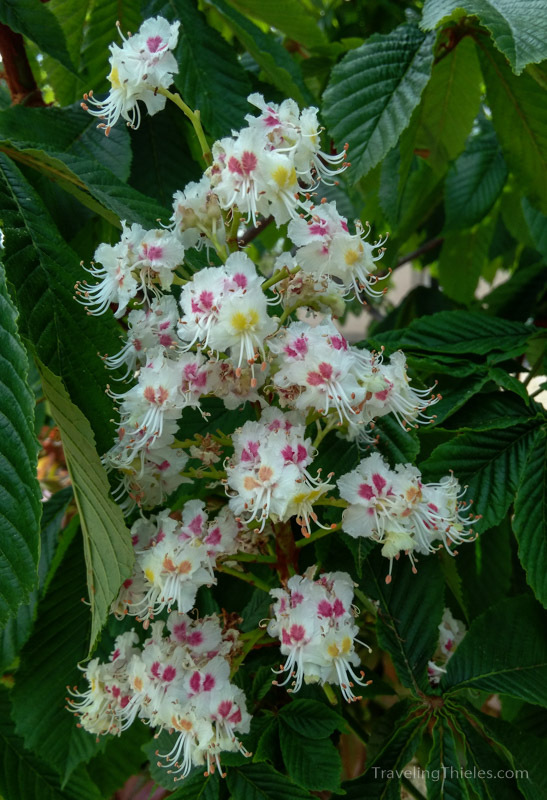 We have never seem blooms as tight as these. 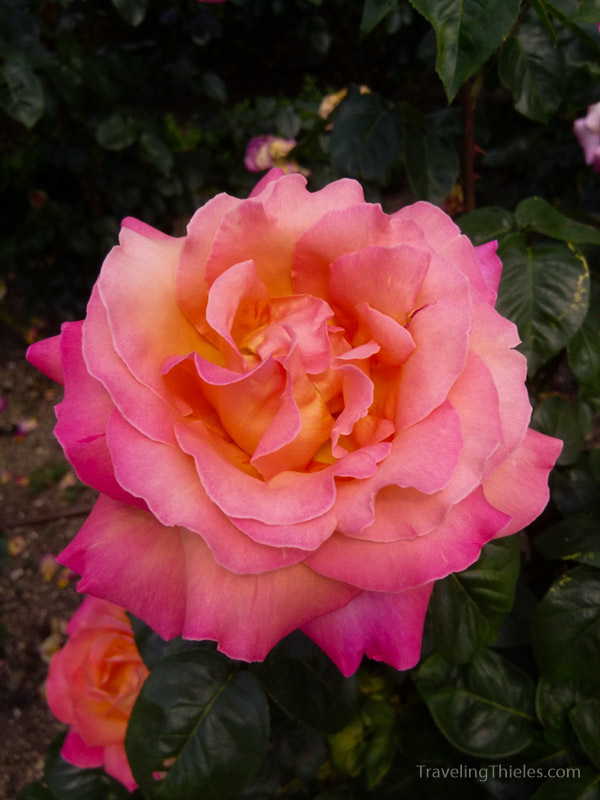 Beautiful coloring on this rose. 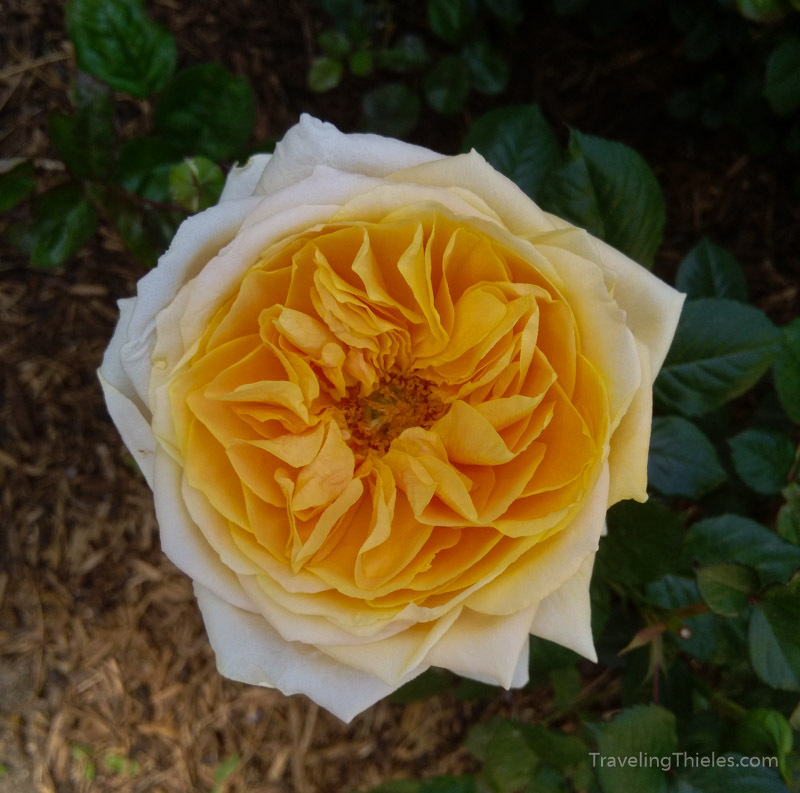 Another tightly packed rose in yellow and white. Looks like an egg. 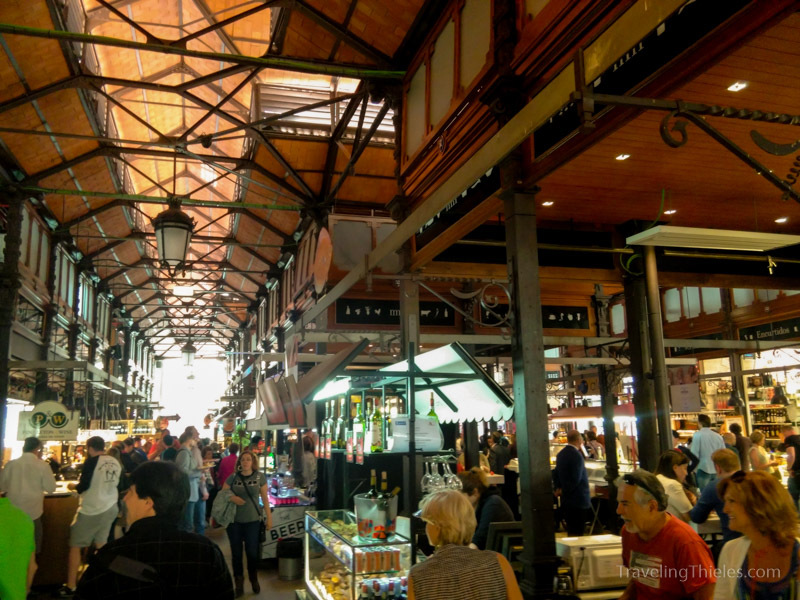 We visited the San Miguel market in downtown Madrid several times during our stay. An entrepreneur turned the derelict building into a gourmet food market some years ago and the concept worked great. Most of the food was very expensive but it all looked tasty. 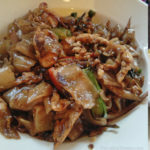 As travelers with limited time and appetites, we like that you could quickly get some food in small portions. That way we could try as many things as possible. 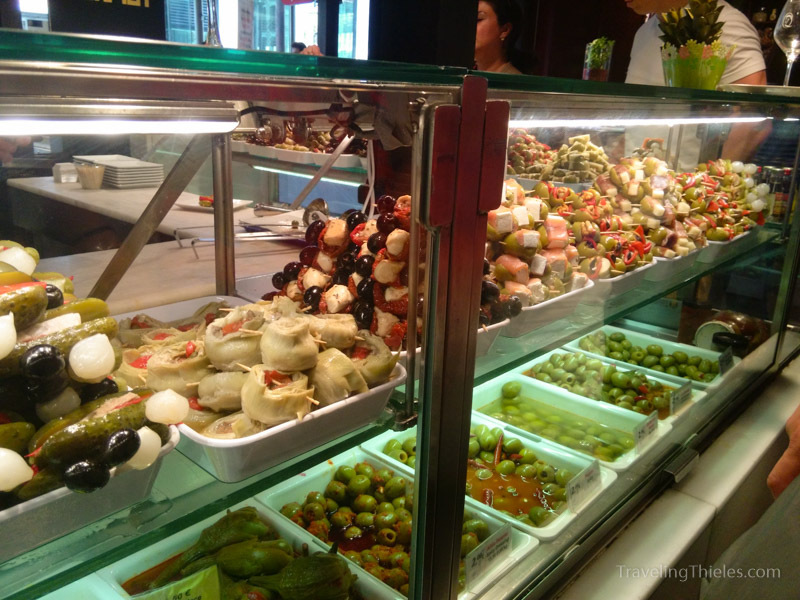 There were a couple pickle and olive stalls in the San Miguel market which made Elisa’s mouth water, in particular. Our favorite stall was one that focused on smoked seafood. 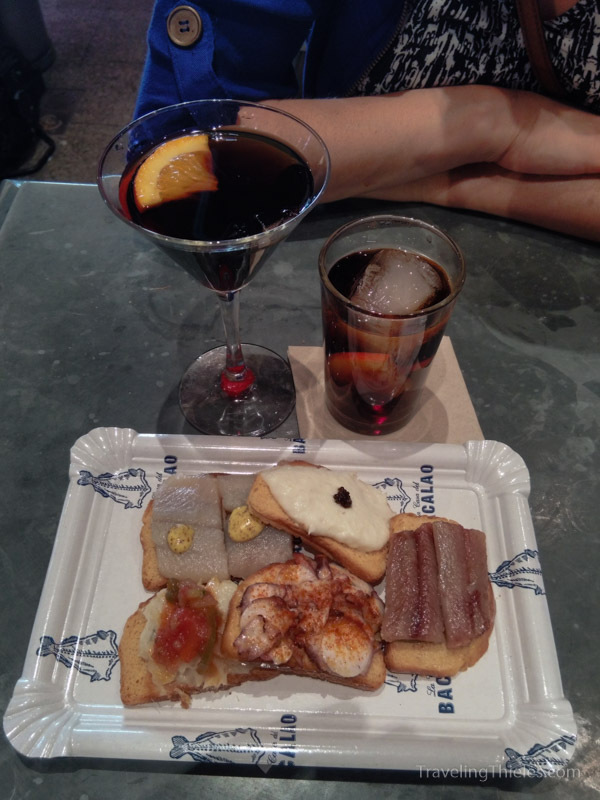 The white one in the pic is caviar, the others are herring, sardine, salmon and tender octopus. 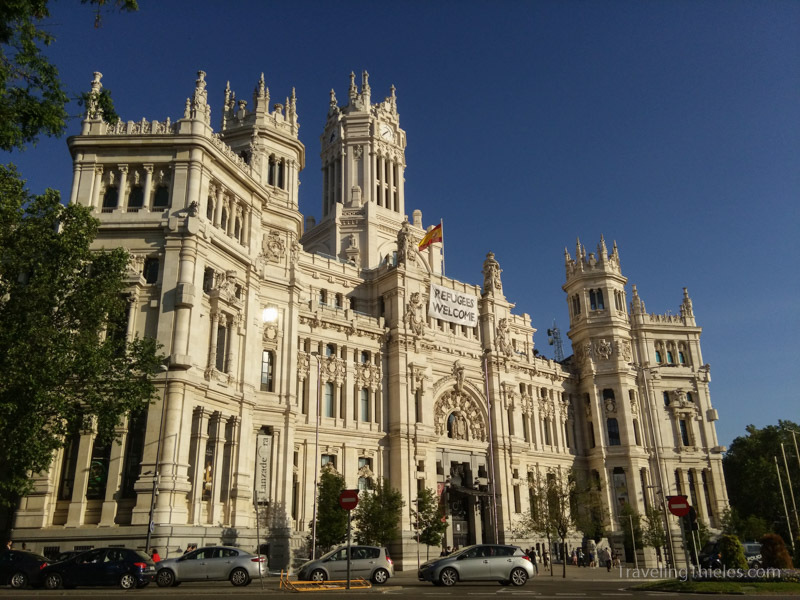 As one would imagine for being the seat of Spanish power for over 500 years, Madrid has some ostentatious buildings lying around. It also seems to have more sidewalk cafes than any other European capital city, but I could be wrong. Hola! 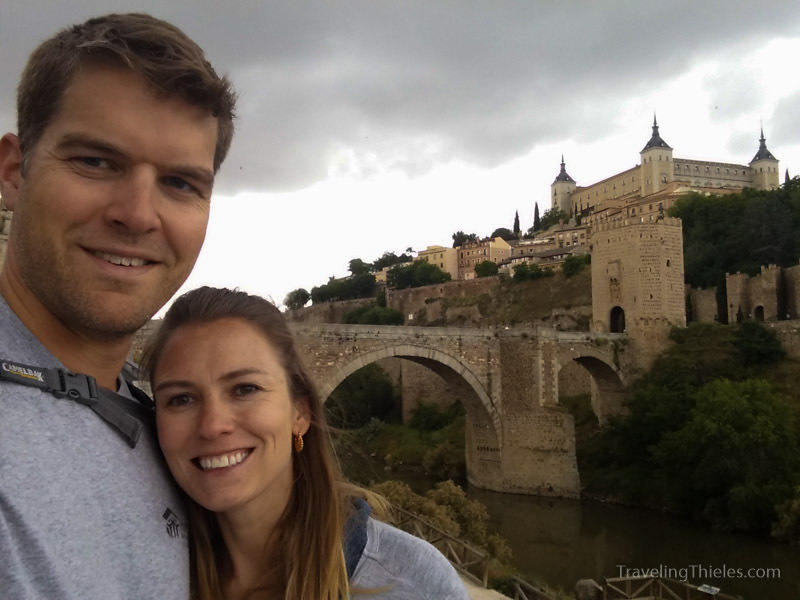 We tried to practice our Spanish during our two weeks in spain but frequently we just got English spoken back to us. 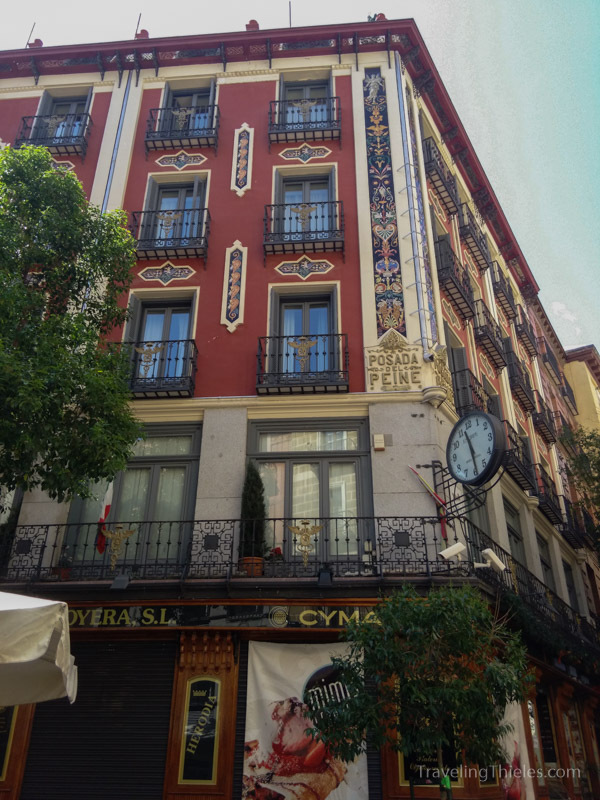 This building is one of the oldest hotels in the city (still operating). It was originally a beggar’s hotel, where the poor were allowed to stay for the equivalent of $1 in todays’ money. 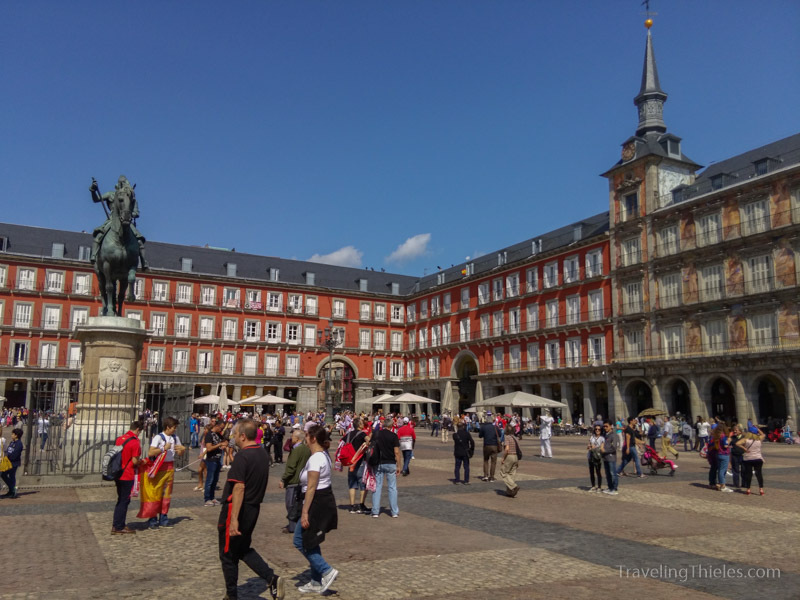 Plaza Mayor was crowded and touristy. Lots of hawkers with annoying whistles. Another cool building. 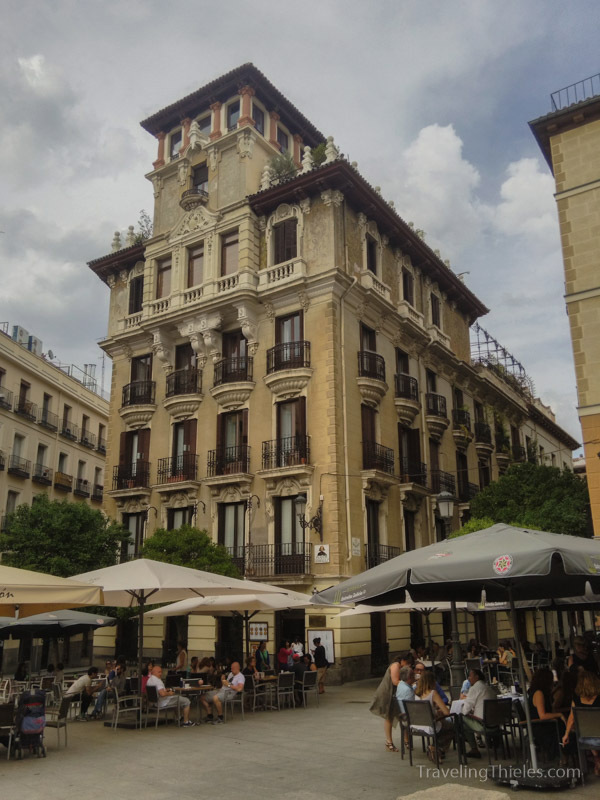 Madrid like Barcelona is also proud of its open door policies for refugees. However, when you look at a chart of the number of refugees accepted per European country, Spain is down near the very bottom. 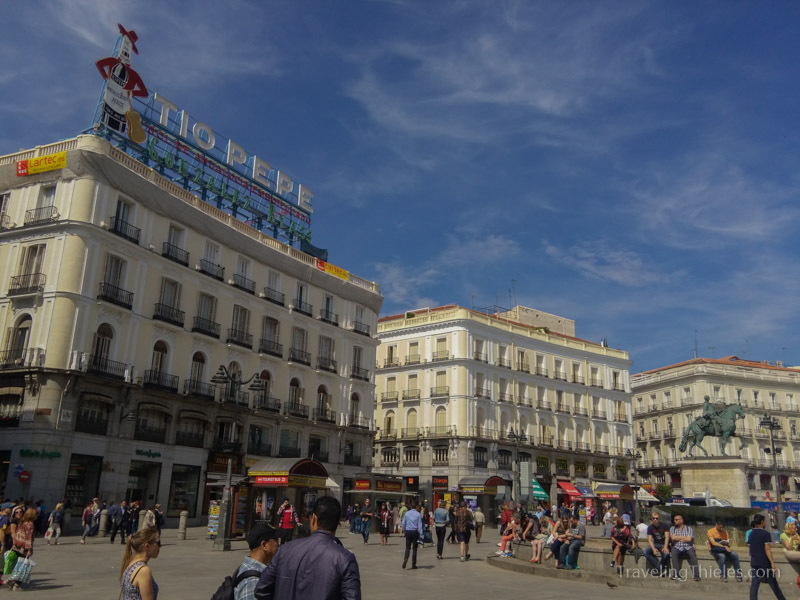 Plaza del Sol is a central meeting place in the city and was always very crowded each time we transited through it. 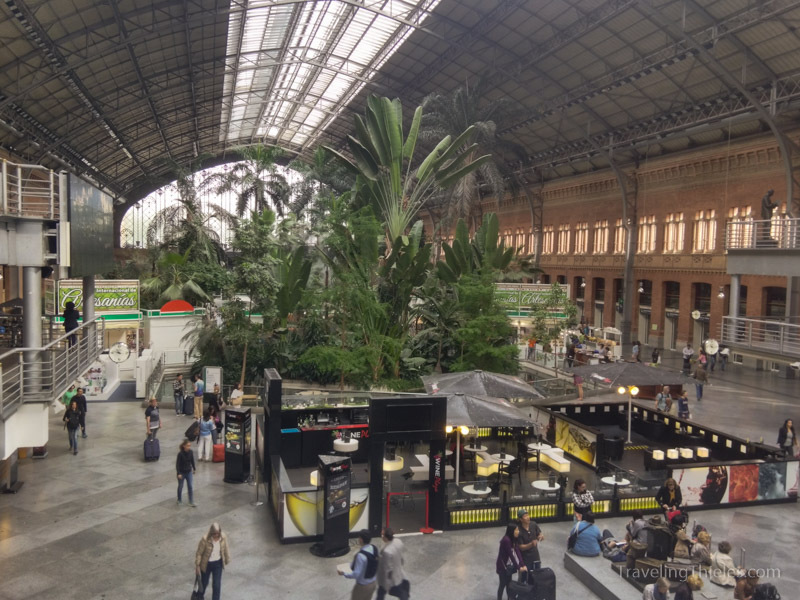 Our main stop was the Corte Ingles department store for free toilets. 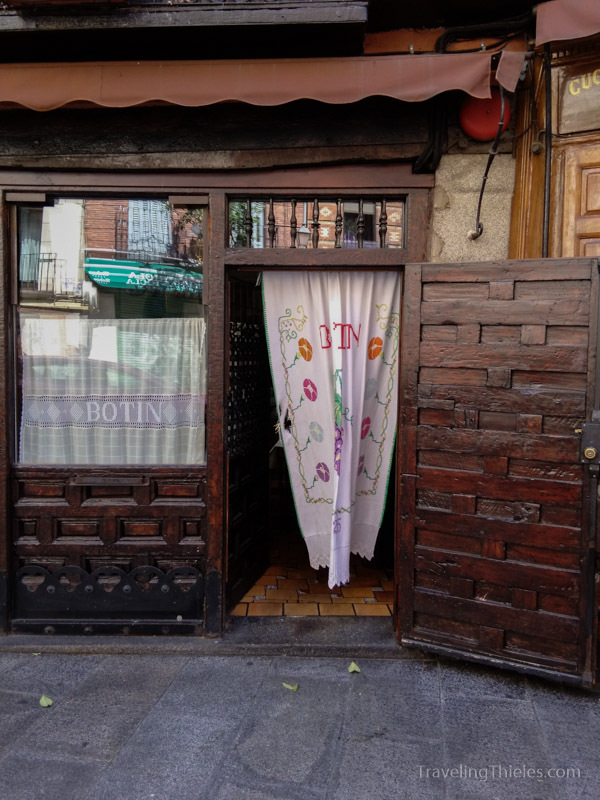 We visited restaurant Sobrino de Botin on our walking tour which is listed as the oldest continuously operated restaurant in the world, since 1725. 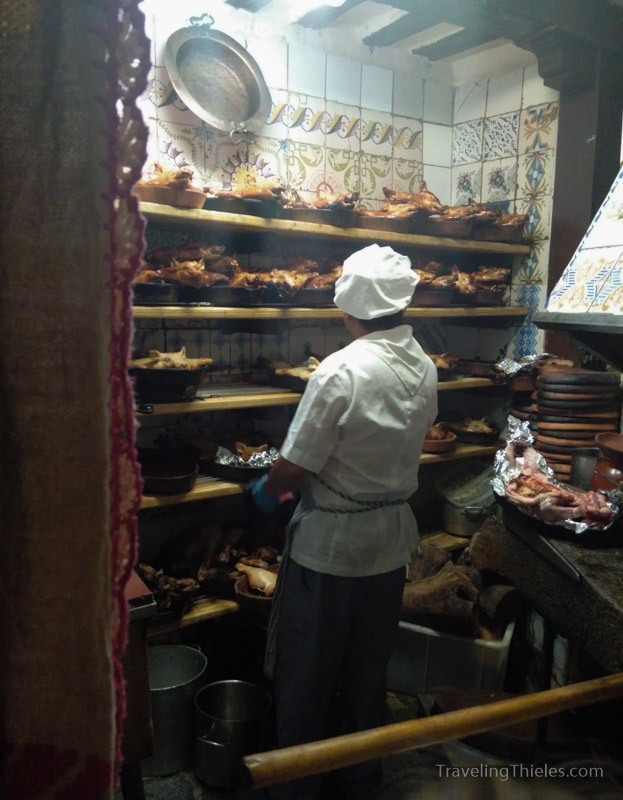 The restaurant is known for its roast suckling pig, which Mayne found disturbing.. when Ernest Hemingway visited he ate an entire piggy himself along with three bottles of wine.. The dining room oozed character. 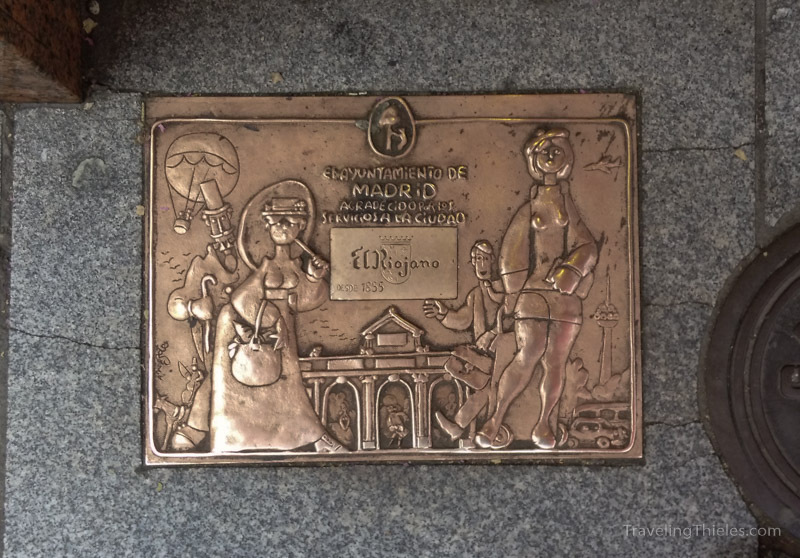 Helpful for picking out authentic eats, the city of Madrid places these plaques in front of each restaurant that has been continuously operated for at least 100 years. 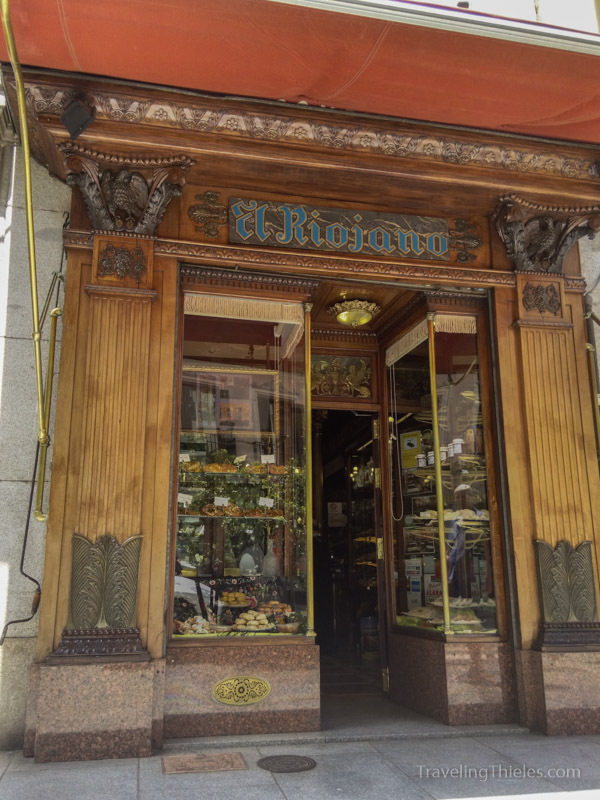 We had some pastries from this plaque-worthy restaurant and can see why it has been around so long. 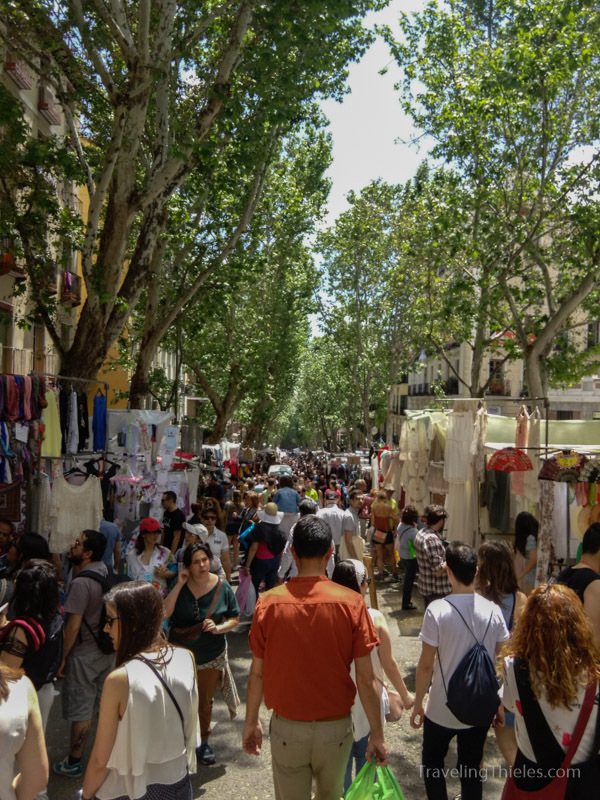 El Rastro is an area which has a lively street fair on the weekends. It was mostly cheap clothes from asia but the people watching was fun. 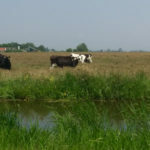 The impression we got of the locals was that they love the fiesta! We typically went back to the hotel around 9 or 10 pm which we thought was reasonable. 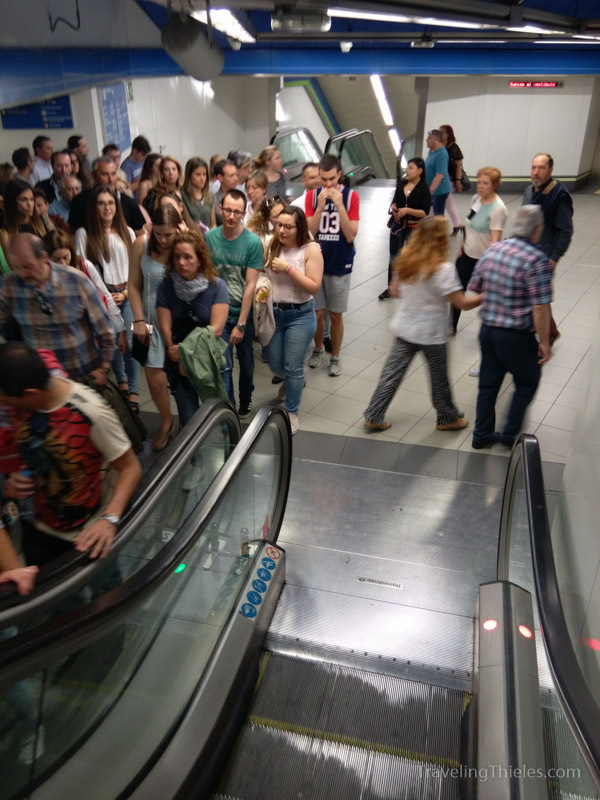 However, this shot entering the metro to leave the downtown area in the evening (with many others just arriving to it) gives you an idea of how much in the minority we were! 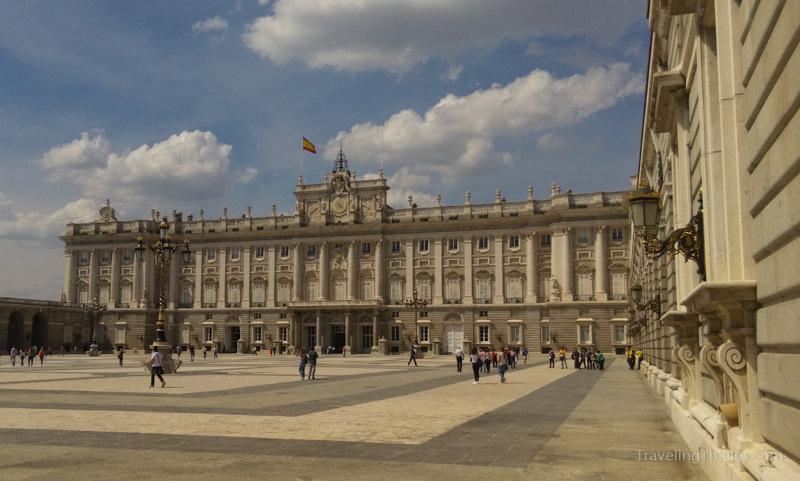 The Palacio Real, or palace of the Spanish kings, was Elisa’s favorite stop in Madrid. 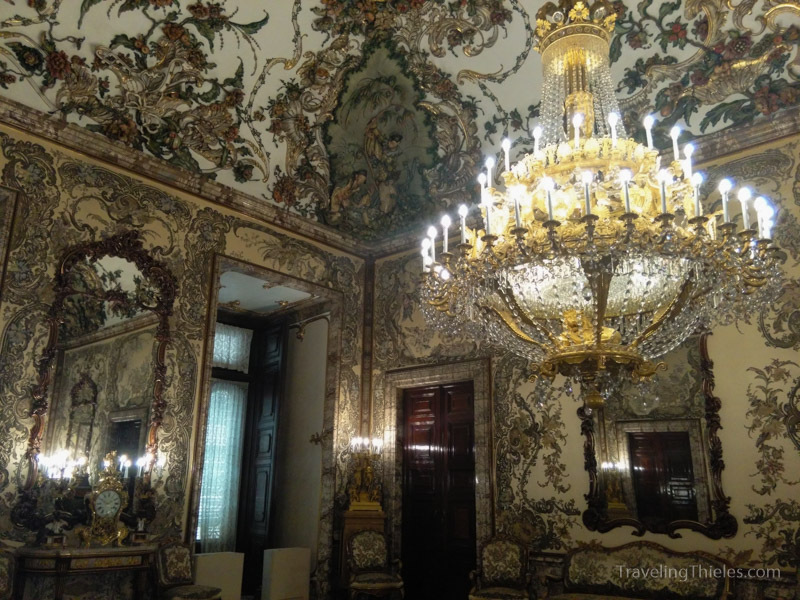 The rooms inside were just silly in how ornate they were. 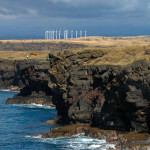 Parts of it are still used for royal functions. We also heard about how the Spanish view the last king of Spain Juan Carlos who abdicated his rule in 2014. Apparently he had a very low approval rating stemming from a corruption investigation into the business dealings his daughter’s husband and an lavish elephant hunting trip (yes, apparently they do exist) he took to Botswana in April 2012 in the midst of Spain’s financial crisis. 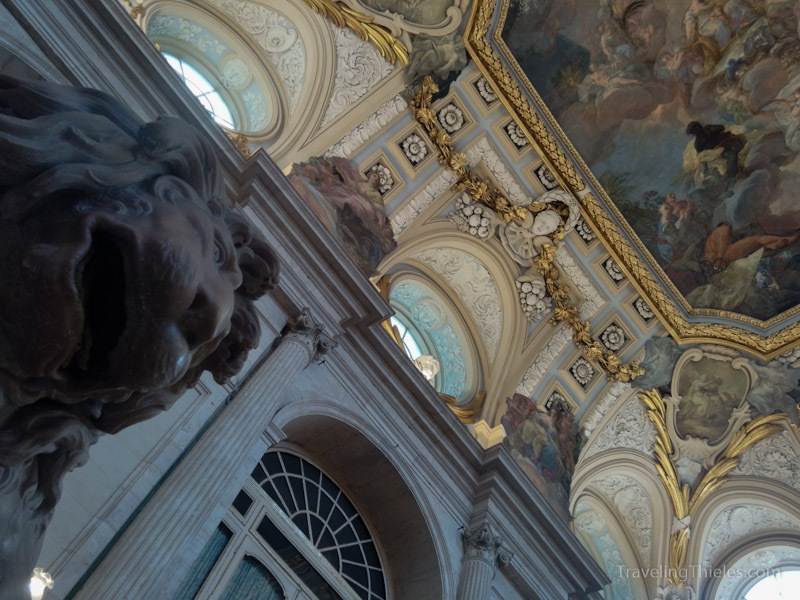 This is the main staircase in the palace. 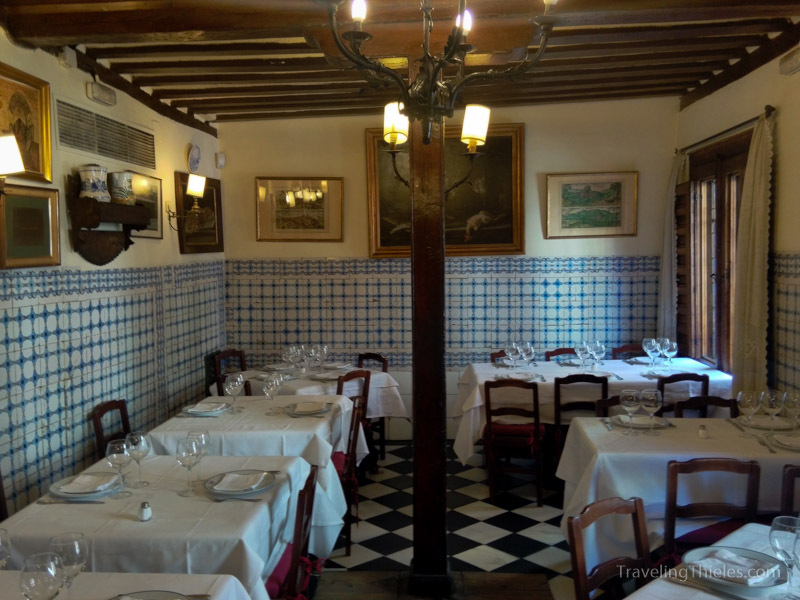 This room was all molded plaster, another room was all fancy tiles, some were all marble, etc. 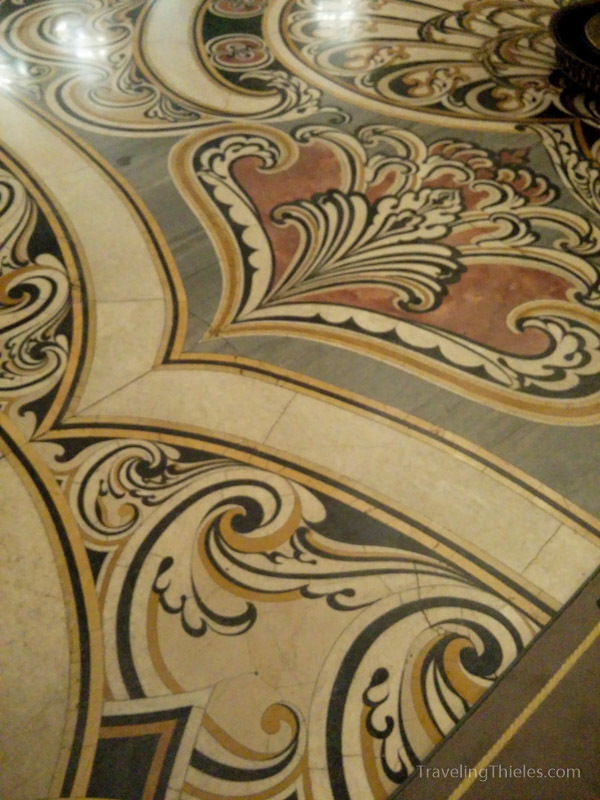 Intricately inlaid marble floors in the palace. We were trying to find the cathedral and stumbled into this building, which was the crypt underneath the cathedral (which we never ended up going into!). The crypt was a cool relief from the harsh sun and very peaceful. We were expecting tombs many hundreds of years old but some were from 2015! 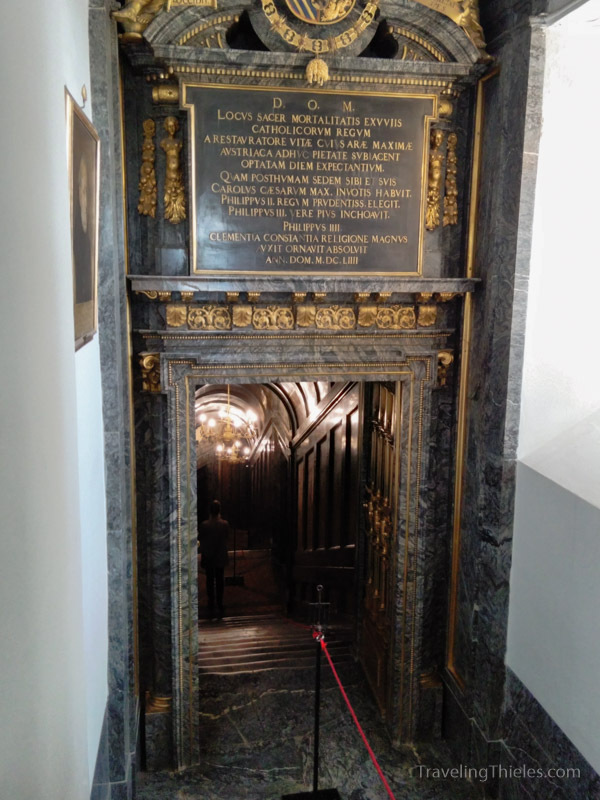 Turns out the crypt was only opened in the past decade or so when the cathedral was finally finished after 200 some years of work. The crypts can be bought for a couple hundred grand. We tried a local liquor called Madrono. 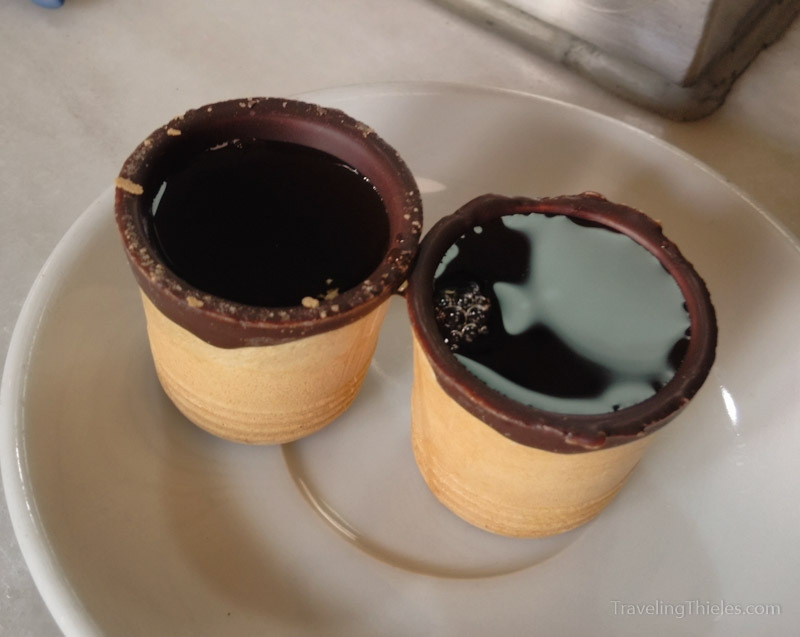 It was okay but the best part was the edible waffle cone shot cup lined with chocolate that the liquor was served in! 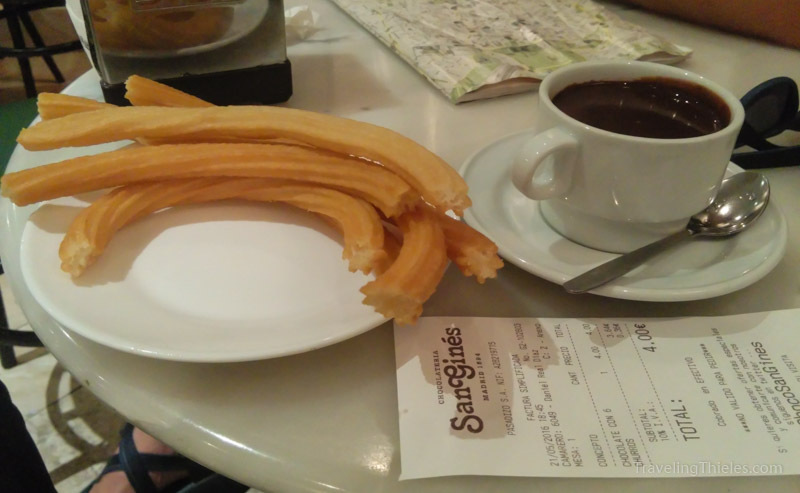 We got churros and chocolate from the most famous churros shop in town. Kinda like café du monde beignets in New Orleans, we were underwhelmed by the experience.. 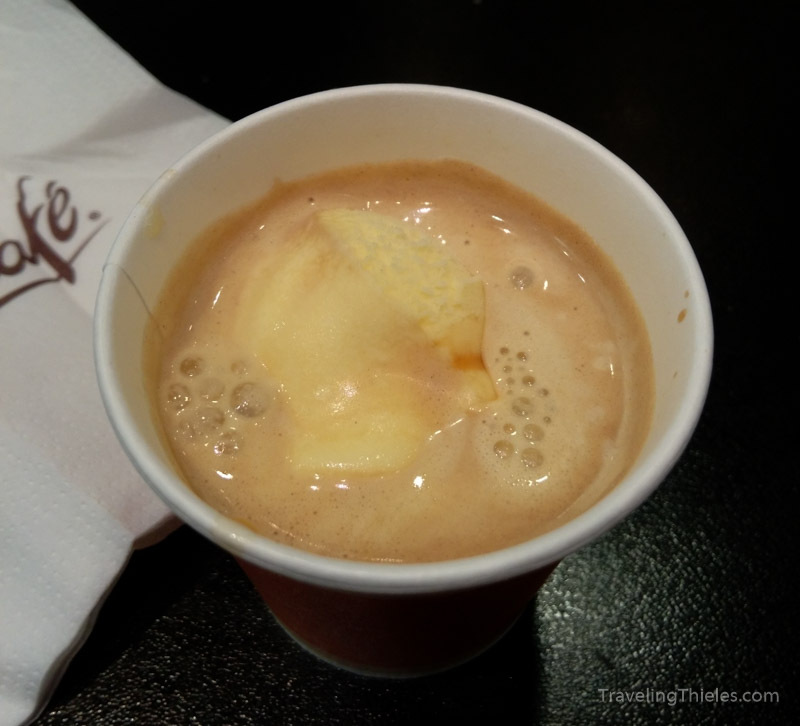 The coffee with ice cream at McDonalds for $1 however was just what we wanted! They have McCafes in Europe which have legitimately good espressos for cheap. 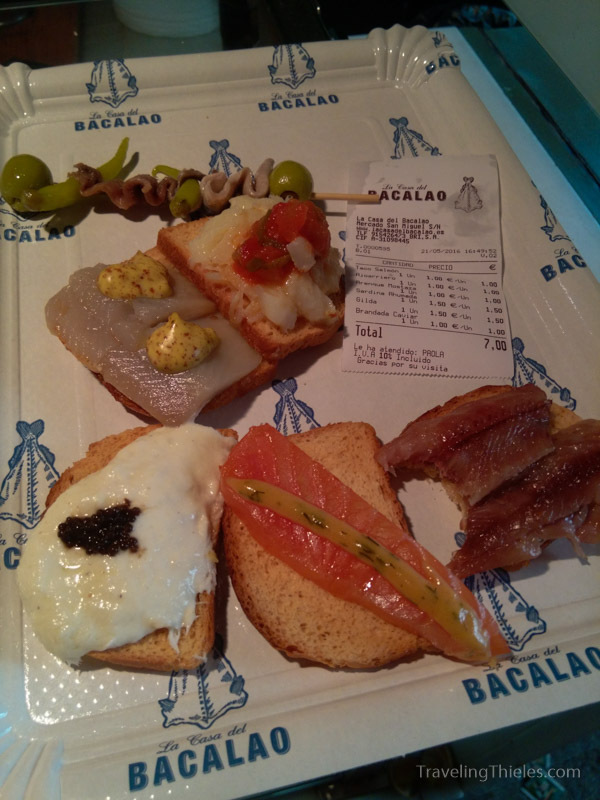 Madrid proved to have very cheap eats just like Barcelona. The purchase seen here from the grocery store was about 7 euros, or 8 bucks. 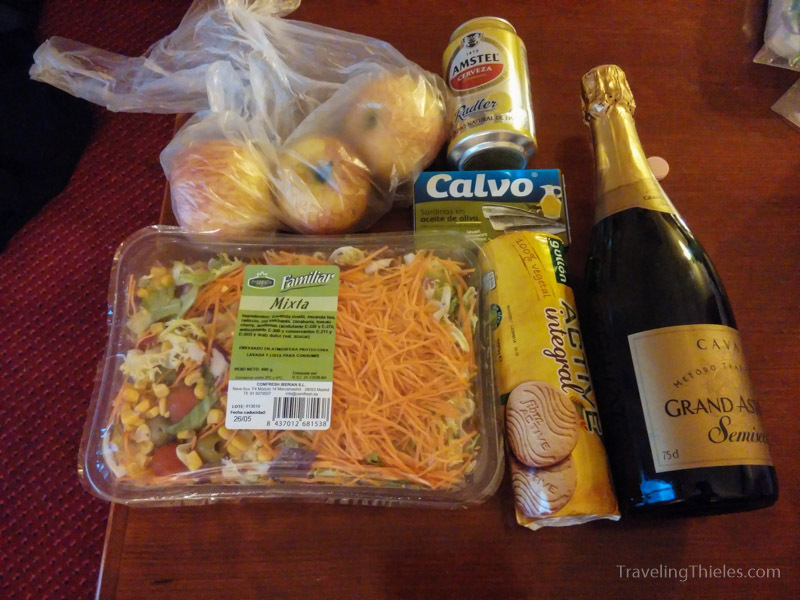 The most expensive thing was the $2 bottle of Cava, or Spanish sparkling wine. The wine was pretty good even. 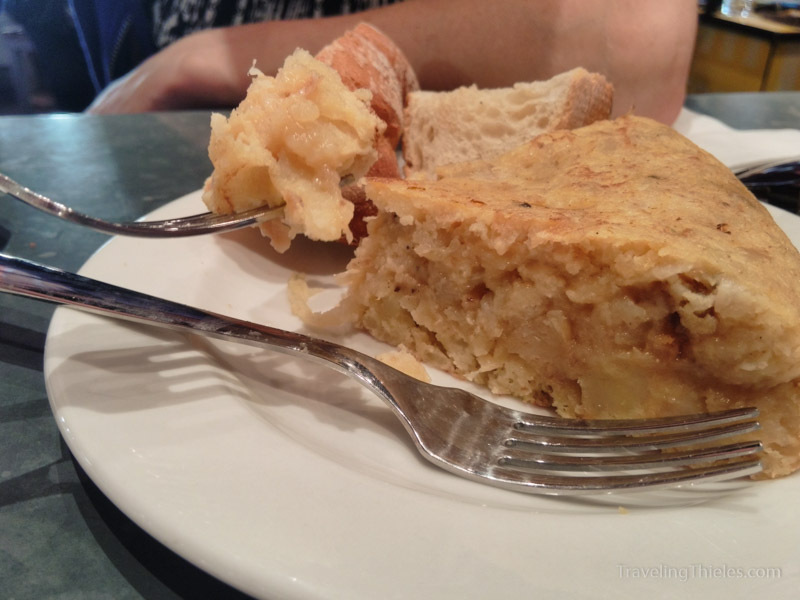 A great snack any time of the day is tortilla espanola, a simple dish of chopped potatoes, onions and garlic fried in olive oil. This one was perfectly cooked from the San Miguel market. 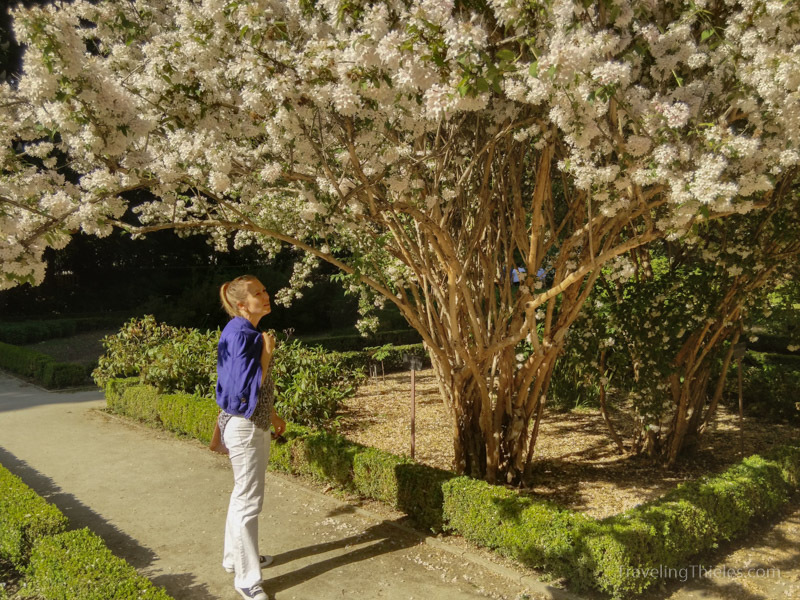 We visited the botanic garden just outside the museum del Prado and saw this great flowering tree. 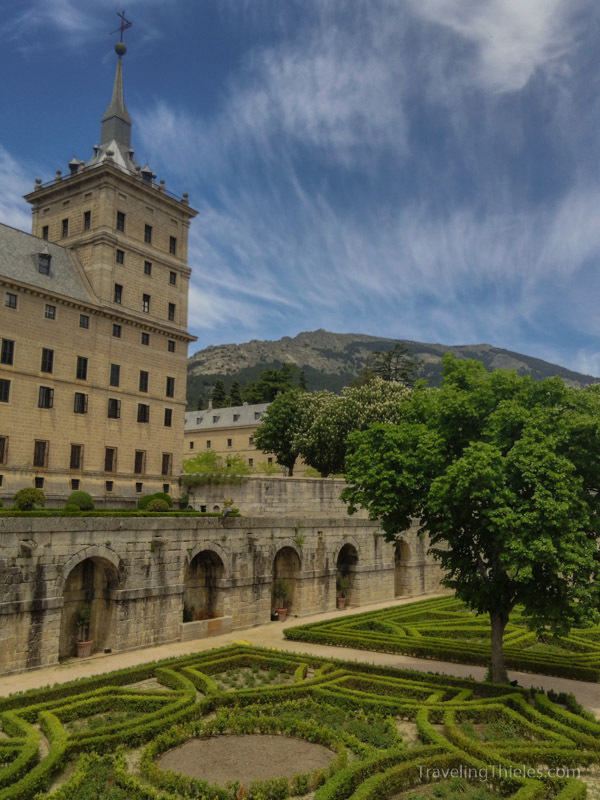 On a day trip we took the train to El Escorial, a giant monastery and kingly retreat in the hills outside of Madrid. Since the locale was outside the city’s urban heat-sink and higher in altitude, it was wonderfully cool. 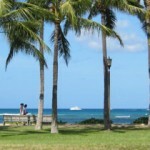 It’s also a very small town with little tourism so it was a peaceful change of pace from the hustle of the city. 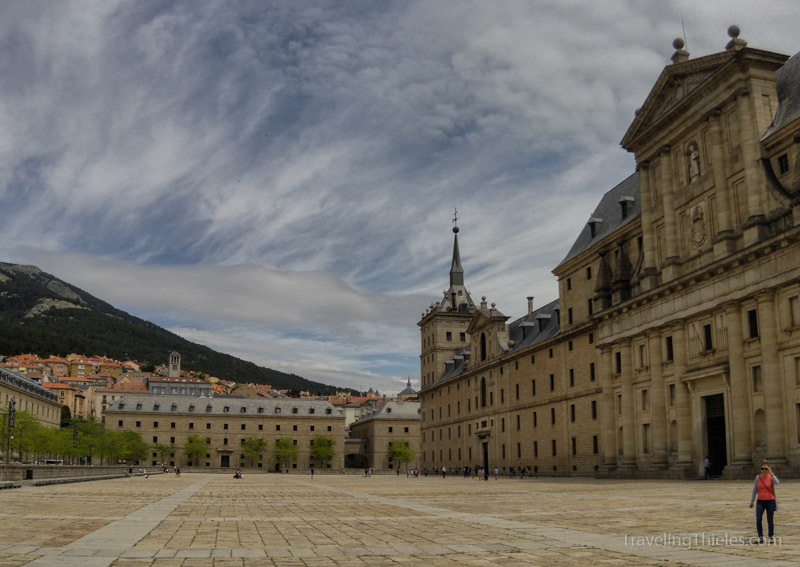 The monastery was impressive in scale and full of history (which we mainly ignored in favor of touring the gardens, soaking up the sun and pastry hunting in the local cafes). 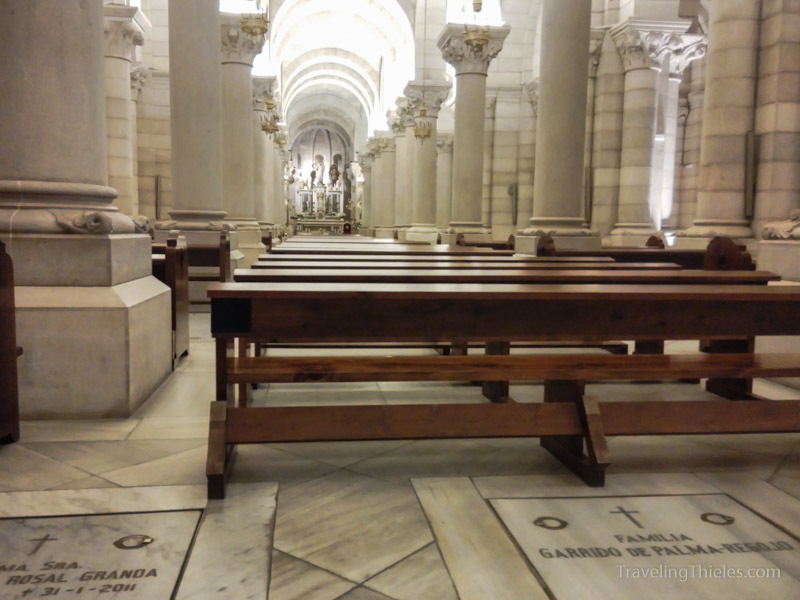 This is the crypt where the bodies of most of the Spanish kings for the past couple hundred years are kept. 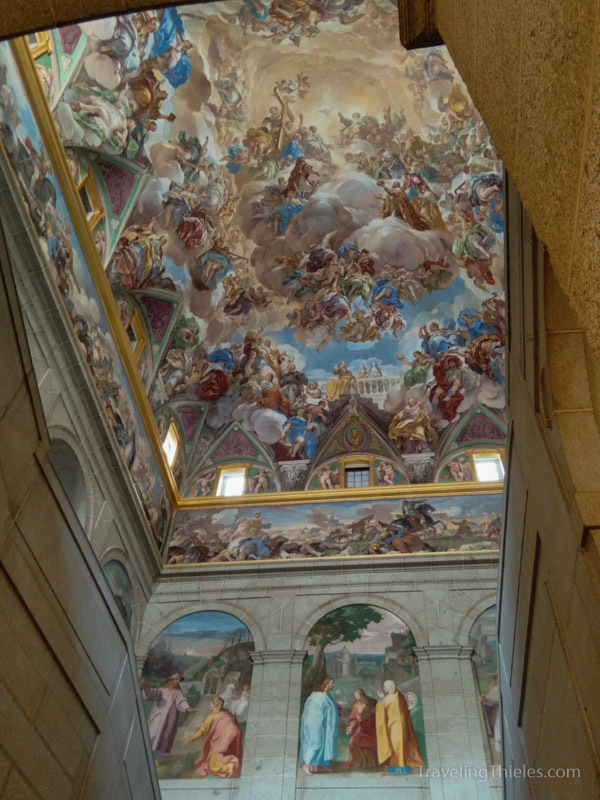 The frescos on the ceilings in El Escorial are better than average for Europe. 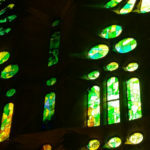 This one in particular was very nice and has a great sense of depth that doesn’t convey well in the picture. 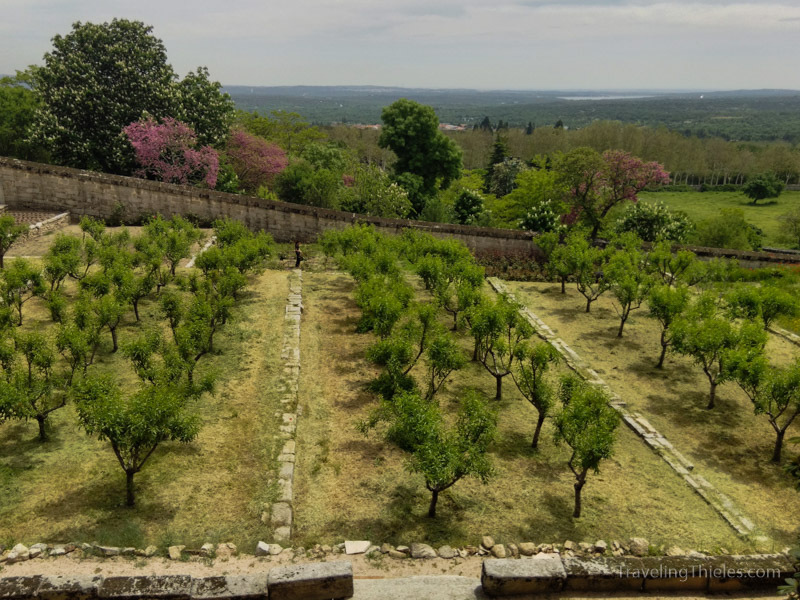 We noticed they had a nice garden of olive trees. The view from the monastery was really good. Not sure what kind of bushes these were but the flowers on them were pretty. Madrid is full of tourist hawkers, including somewhat uniquely these people dressed up as various characters. 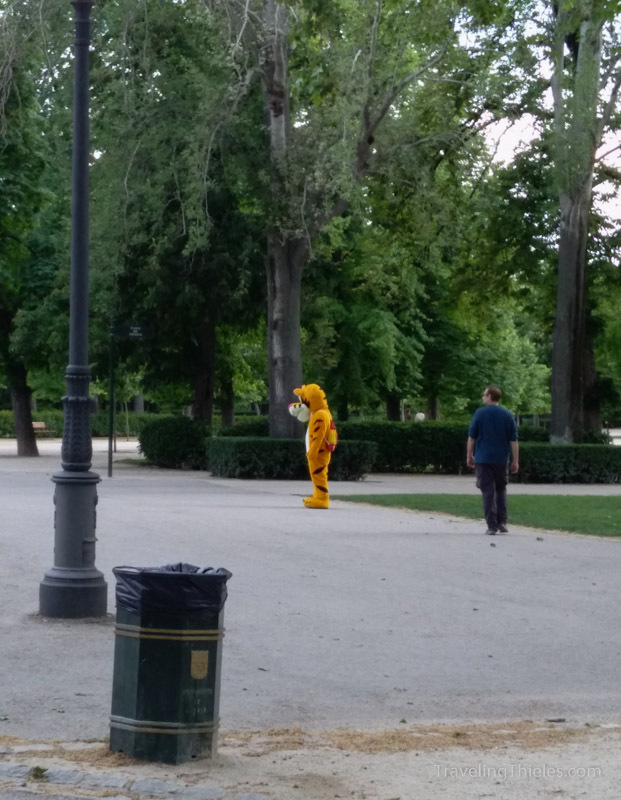 Tigger however was not feeling much love on the day..
Madrid made good use of their old train station and turned it into this indoor shopping complex with some nice green space. 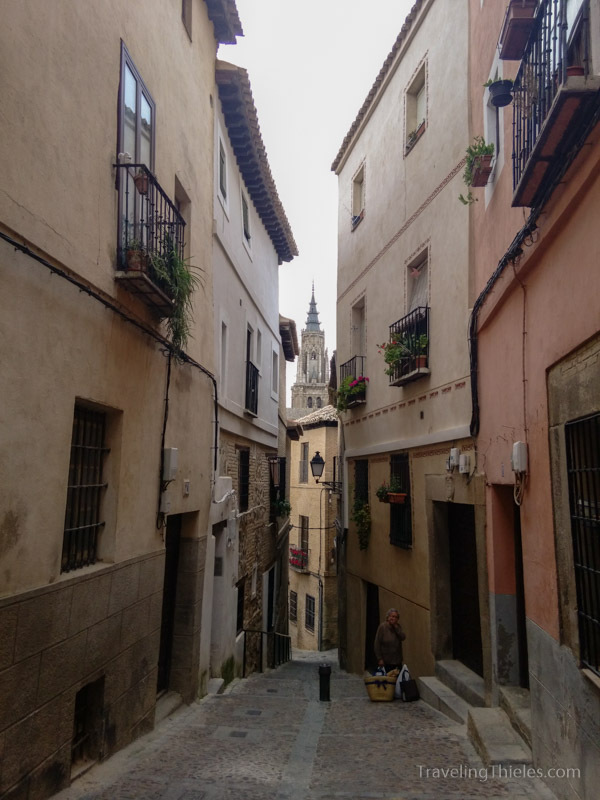 Our second and last day trip from Madrid was to the city of Toledo, which is the former seat of Spanish power from a couple hundred years back. It’s a city built of a hill, and exists now seemingly just for tourism. 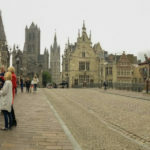 However, the hordes of daytrippers and shop after shop of exactly the same crap is more than offset by just how darn quaint and picture perfect the old medieval city built on a hill is. We really enjoyed our trip there. 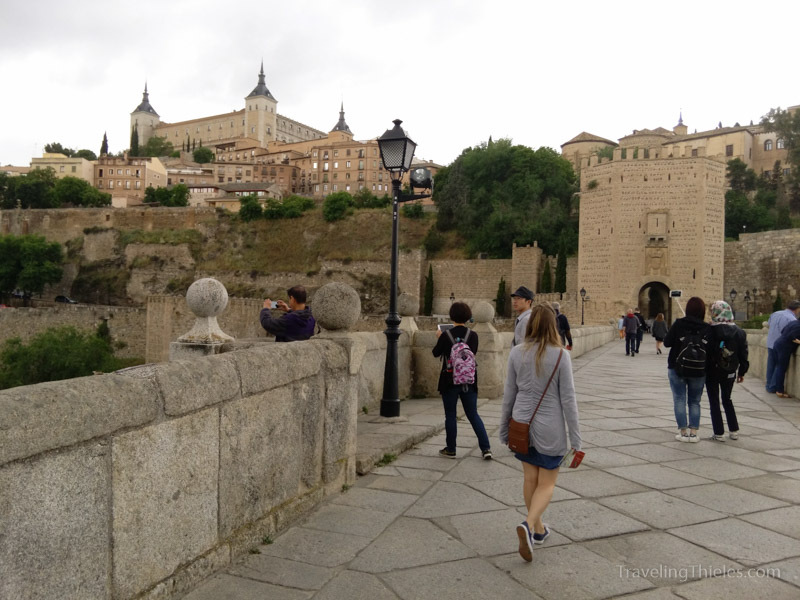 Like many of the little medieval towns preserved in Europe, Toledo is surrounded on three sides by a river, and access is across old bridges like this one. It’s all up-hill in the city. 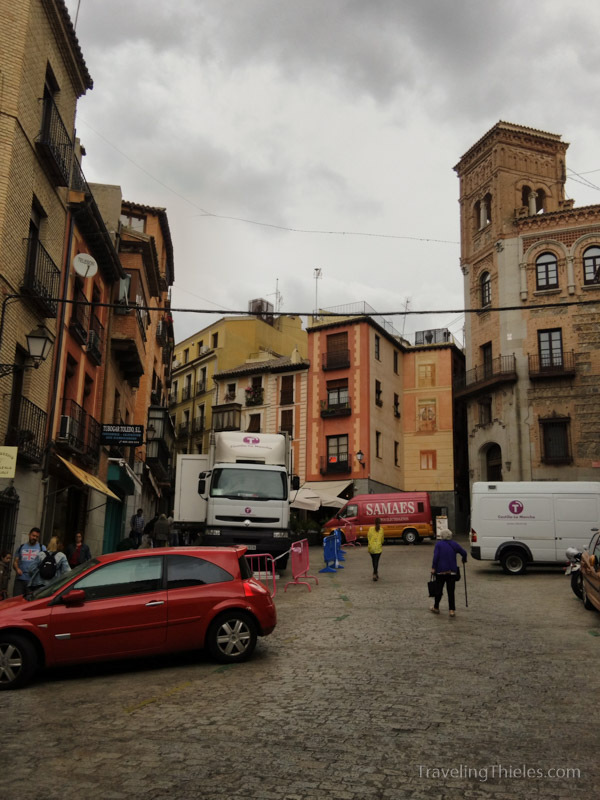 Toledo is where arms and armor were made for centuries and seems to take great pride in this fact. Fun fact – it’s where most of the swords for the Lord of the Rings movies were made. 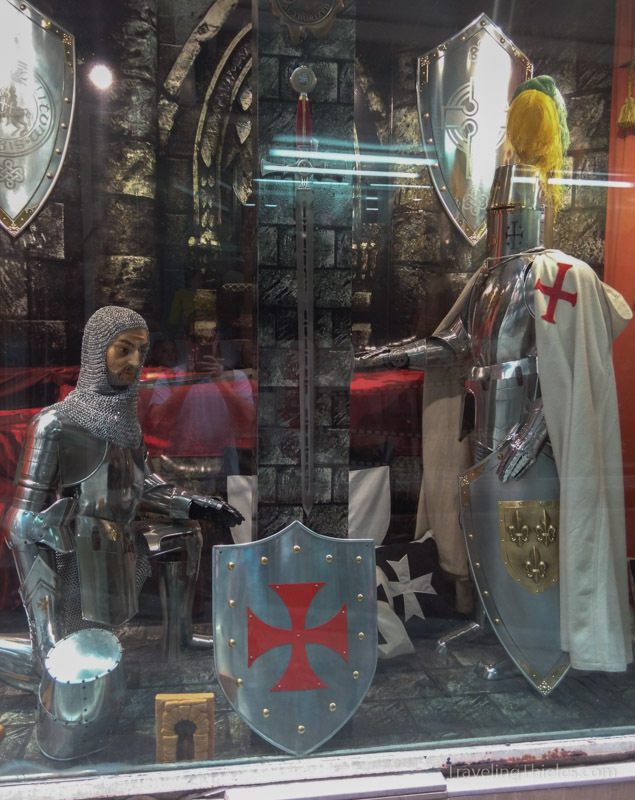 Anyhow, Mayne decided one of these suits of armor were on his birthday list. Little old streets and little old ladies = classic Europe. 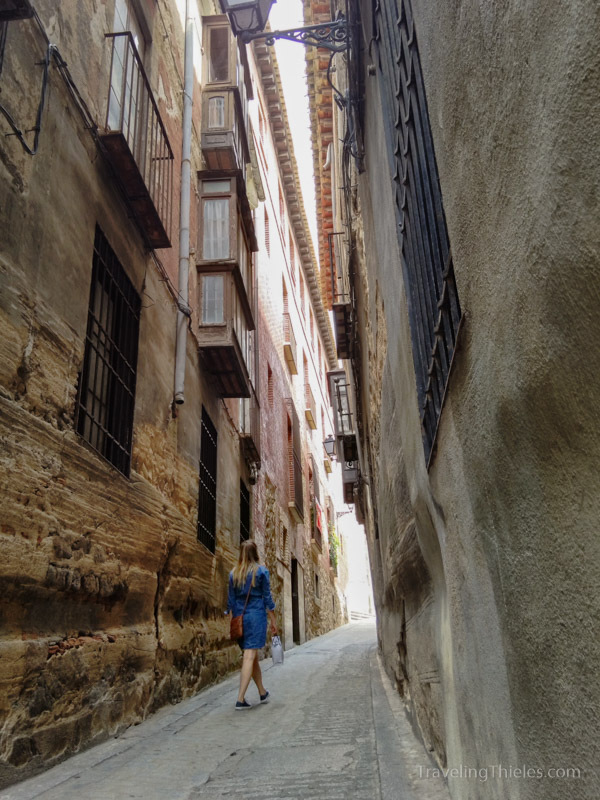 Elisa hiking up a street that looks like its walls have been eroded/scraped by a couple thousand rearview mirrors over the years. 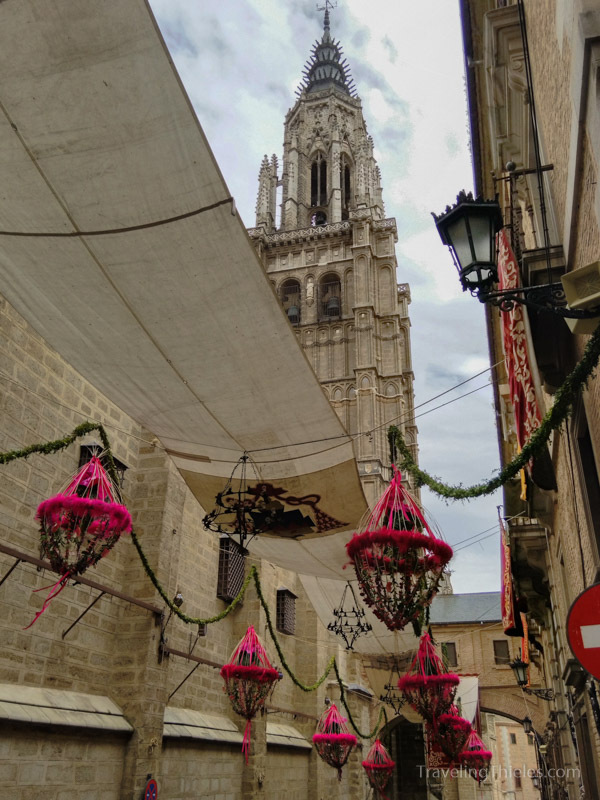 They were gearing up for some festival while we were visiting and literally every street in the medieval quarter were being decorated with flowers, draping and these neat tarps. 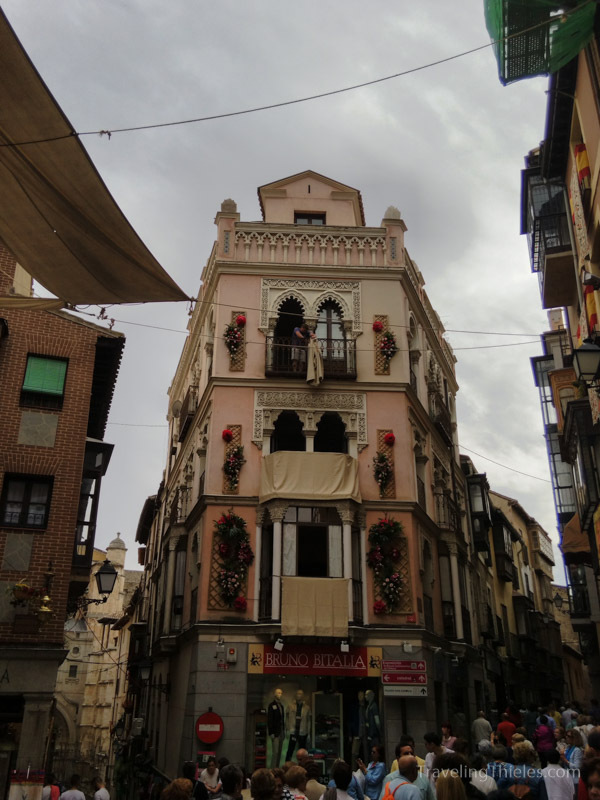 The tarps, we decided would be a neat addition to any old city since it shaded all the streets nicely. Add those and maybe also monkeys. A nicely decorated building with loads of tourists admiring it. 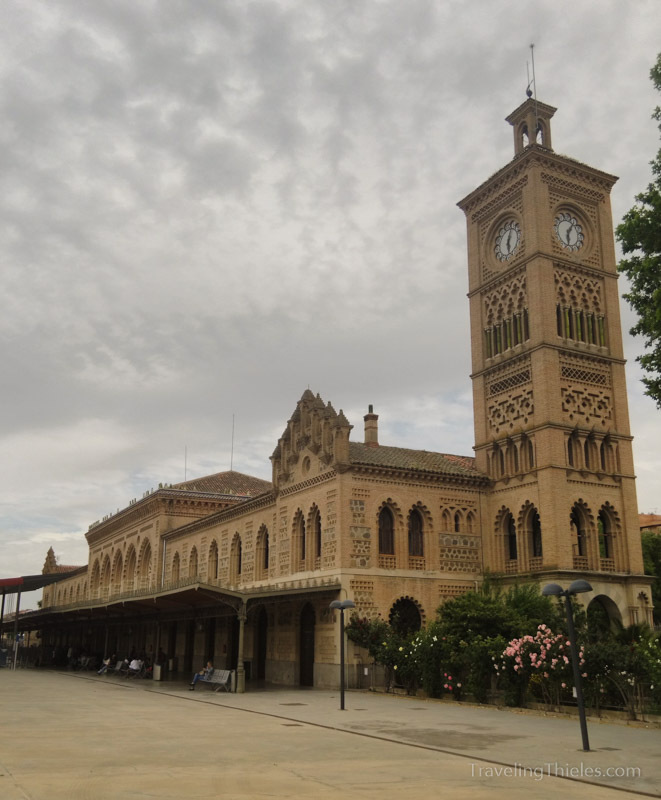 The Toledo train station is a real beauty, with Moorish architecture that doesn’t seem to fit with the rest of the city. We’ll catch back up with Belgium soon! Love all the beautiful pics. You are doing a trip of the lifetime. Stay safe and have fun. We love you.